Timberland has special veterinarians to offer you: compassion, experience and personal pet care–obsessing about their clients and not competitors. Our veterinarians Dr. Merle and Dr. Becky Marks are a husband and wife veterinarian team. Their clinic is centered around core values such as honesty, patient advocacy and education. They want you to take an active role in making choices in your pet’s care. Yes, they take great effort to give you the information and expertise to help you but they understand that you want to be involved in the process. Our clinic provides medical, surgical, dental and boarding services. Marks were the first clinic in Oregon to provide the CCL tear surgery called theTight Rope . painful back , vomiting or can't urinate? Within minutes you can have the full body images. It is also safer for the pets and technicians because there is less exposure and no chemicals. 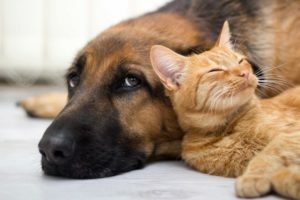 When your dog or cat is sick checking blood and urine for information such as kidney function, liver function, infection or anemia is imperative for a diagnosis. We can do these samples in-house when lab results are needed stat! New pet? Whether kitten or senior our attention is focused on a relationship with you and your pet. Why? We really love pets and people! We can teach you to train your puppy to ring a bell! Nutrition and preventative care help you keep your pet healthy longer. We can help! We know your pets will love us and our clinic. The veterinary clinic is on the east side of Portland/Gresham border.